Our Exclusive – designed and made by Villageworks, for Fair Trade Scotland. Artisan – the skilled craft workers who made the product by hand. 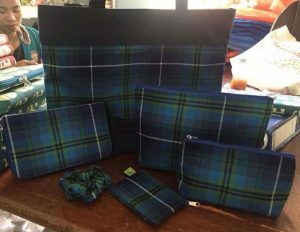 For this run of products ONLY we are using Tartan woven by House of Edgar as a quantity was ‘gifted’ to Villageworks to produce the first run. At the moment we are not sure how many of each product we will have but probably not more than 10 of each design. We are currently exploring ideas for the official launch – watch this space for further details. The range will then be made with Organic Cotton with additional items in Silk. It takes approx. two months to hand weave 60 metres of each and we have asked Anak to go ahead and start the weaving. There is a shopping bag, small coin purse, make-up bag, Toiletry Bag, Hair Scrunchie and a Travel Purse/Clutch to hold Passport/Travel documents etc. We have a few more items and will post them when ready. We hope you like the range, costings still have to be finalised.